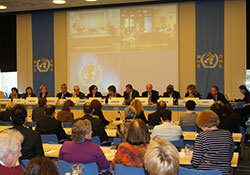 On 16 March 2011, regional directors of the United Nations agencies in Europe and central Asia met in Copenhagen, Denmark, to discuss how to improve coherence and coordination among their agencies. Hosted by Ms Zsuzsanna Jakab, WHO Regional Director for Europe, the Regional Coordination Meeting brought together regional heads and representatives of the United Nations Development Programme, United Nations Economic Commission for Europe, United Nations Children’s Fund, United Nations Population Fund, United Nations Environment Programme, International Labour Organization, Food and Agriculture Organization of the United Nations, United Nations Educational, Scientific and Cultural Organization, United Nations Entity for Gender Equality and the Empowerment of Women (UN Women), International Atomic Energy Agency, and United Nations Industrial Development Organization. welcoming the new United Nations agency, UN Women. The participants warmly welcomed the progress made by a joint working group on health-related Millennium Development Goals, led by WHO. The group meets about every six months, following a related meeting on United Nations development issues at country level. The next meeting is scheduled to take place in Geneva, Switzerland, on 17 October 2011, and the United Nations Deputy Secretary-General will attend.